We packed on Monday and departed early Tuesday to meet up with Matt and Nathan at the McDonald’s in Tupper Lake. 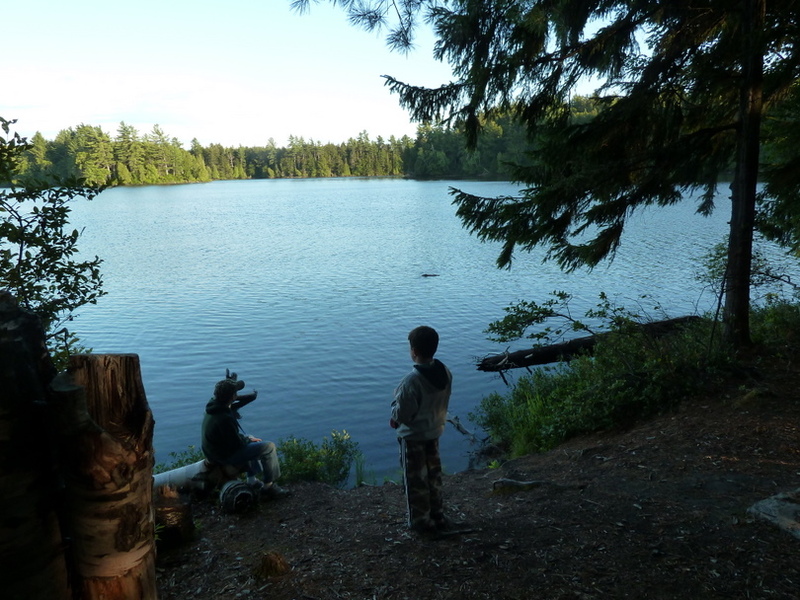 The weather called for rain and we had sprinkles on the way up, but we were counting on a break in the weather before getting a campsite on Long Pond in St Regis Canoe Area. We were to meet Skip at the trail head at noon. We were on time for both our meetings. Eric, Kathryn, Scout and I were in the MN II. Skip paddled my Solo Prism and Matt and Nathan paddled their Coleman. As we packed up our canoes and started paddling across Long Pond the dark clouds rolled in behind us. It rained on us as we sought a campsite. 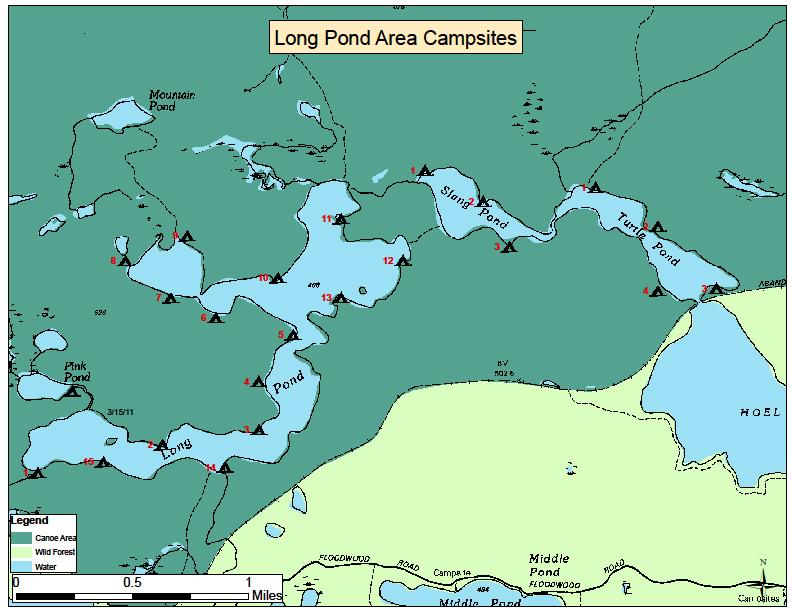 In 2010 a major campsite work project was conducted resulting in closing some campsites. 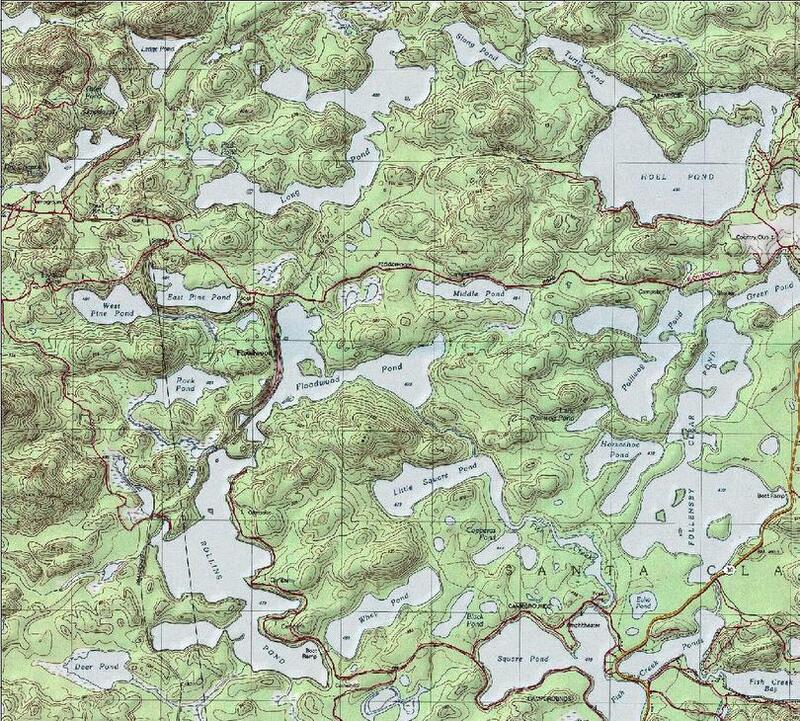 We were last in the area in 2008 and were using the original version of the ADK Paddlers Map. We ended up staying at campsite #10. Concerned about pending rainstorms we quickly set up our tents and two rain flys for protection. We used Tarpology 101 to ensure a drain. Of course, by erecting a couple of tarps we were ensured that it would not rain. 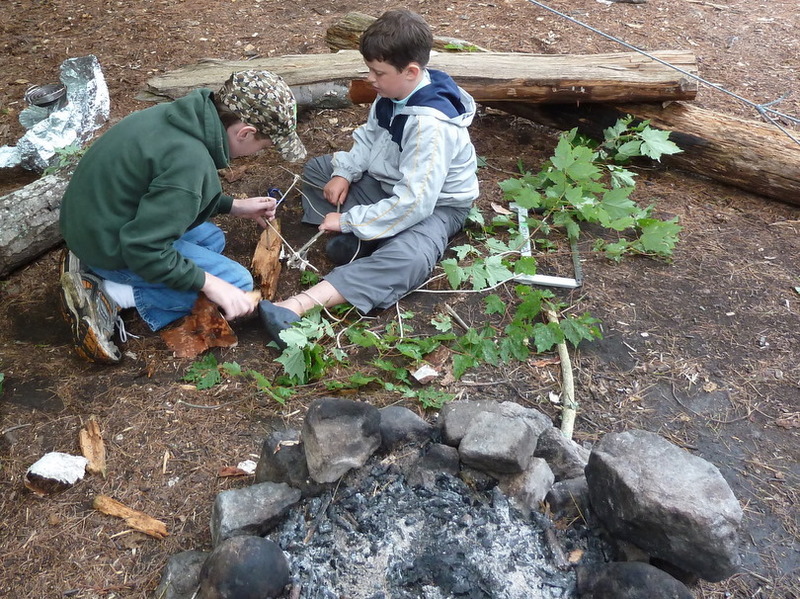 Nathan and Eric entertained themselves by building a fire bow and trying to start a fire like Survivor Man to no avail. Later I gave Nathan and Eric each took a turn starting the evening’s fire using a flint & steel shedding sparks onto a cotton ball swabbed with Vaseline and birch bark. Watching the boys making sparks was entertainment for the adults as well. We did a baking each afternoon as a snack. Dinners were Pasta Primavera, Chicken and Biscuits and pasta. 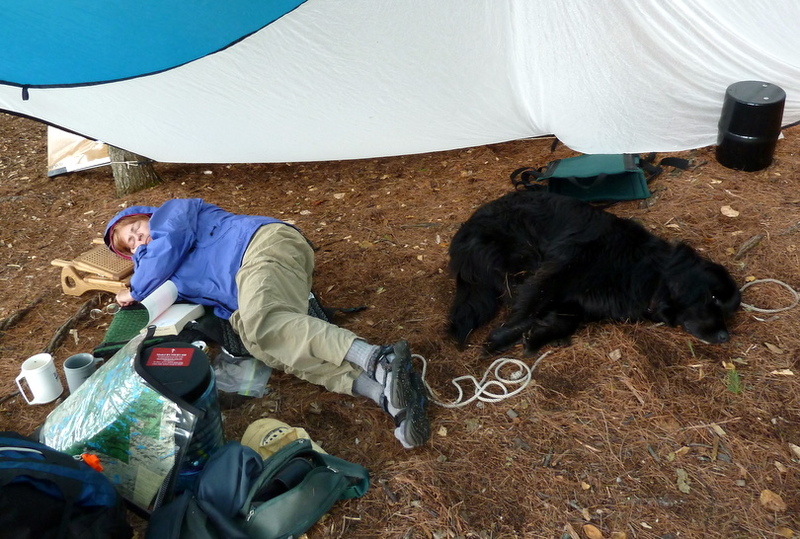 Wednesday was a quiet day, below Kathryn and Scout take a snooze. Wednesday afternoon Matt paddled the solo and Jim, Skip and Matt paddled over to Hoel Pond. Upon our return Matt took Nathan and Eric out for a tour of Long Pond. We took a short hike along the shore line. 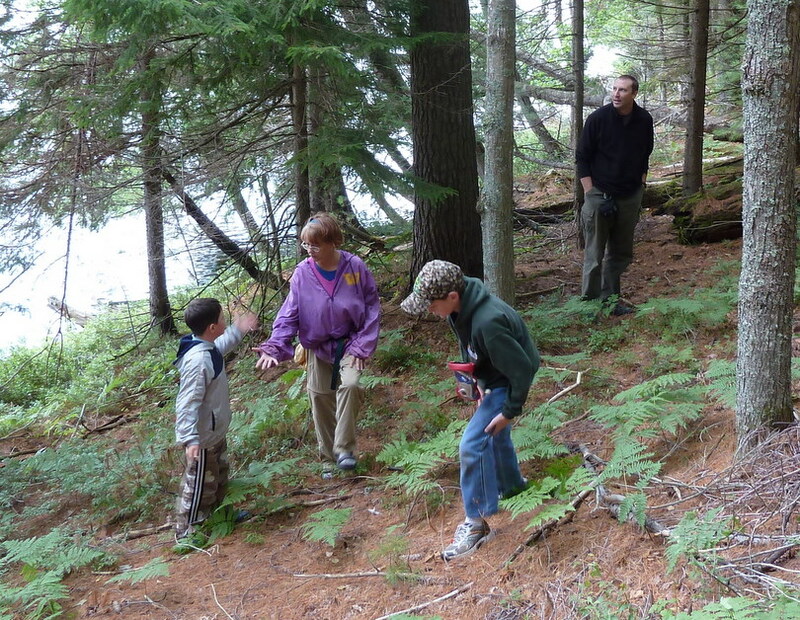 The picture below depicts the group just before Eric stood on a ground wasp nest. He was stung 5 times while none of the rest of us were stung. The wasps got into his clothes. Even after he got back to the tent for Kathryn to apply medicine he got stung on the belly by a wasp hiding in his clothes. Fortunately the medicine (Anti-Bite and Benadryl) and a quick swim in cool water calmed the stings. In the evening our campsite was visited by a beaver that swam along shore and nibbled on the lily pads. The boys got a close up look and pictures. 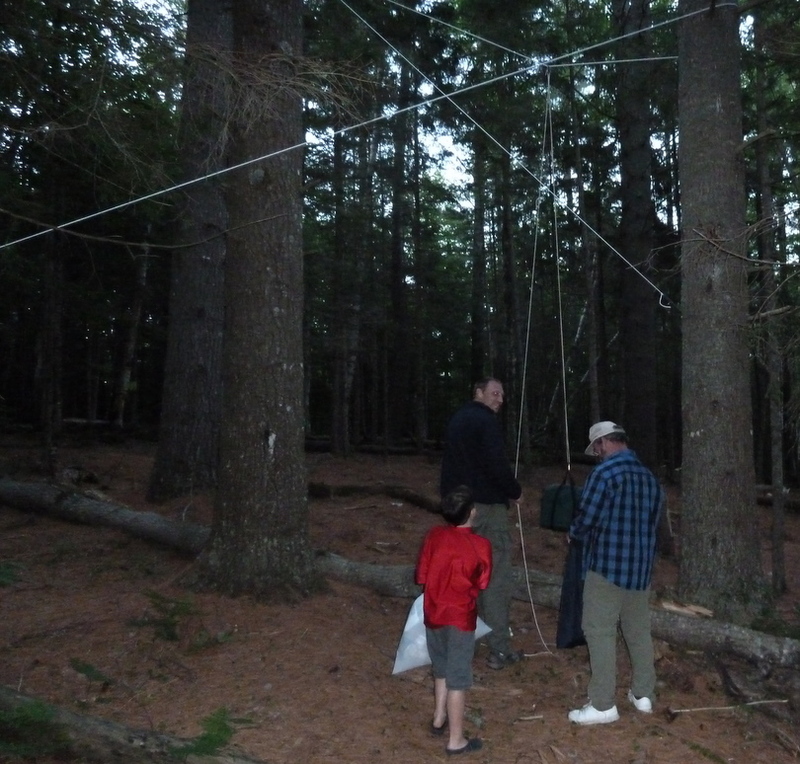 Wednesday night we improved on our design for hanging our food by suspending the food between two trees. Having a carabiner or two is critical to the design. Thursday AM Matt and Nathan enjoy a breakfast of heated up something. After breakfast Matt and Nathan packed up and headed home. We, on the other hand, packed lunches and water and headed out to paddle what is called the Floodwater Loop in Dave Cilly’s Adirondack Paddler Guide Book. Skip paddled the solo. Kathryn and I paddled the MN II with Eric and Scout as passengers. It was a good opportunity to give Scout an entire bay in the canoe and get her more familiar with getting in/out and laying down in the canoe. 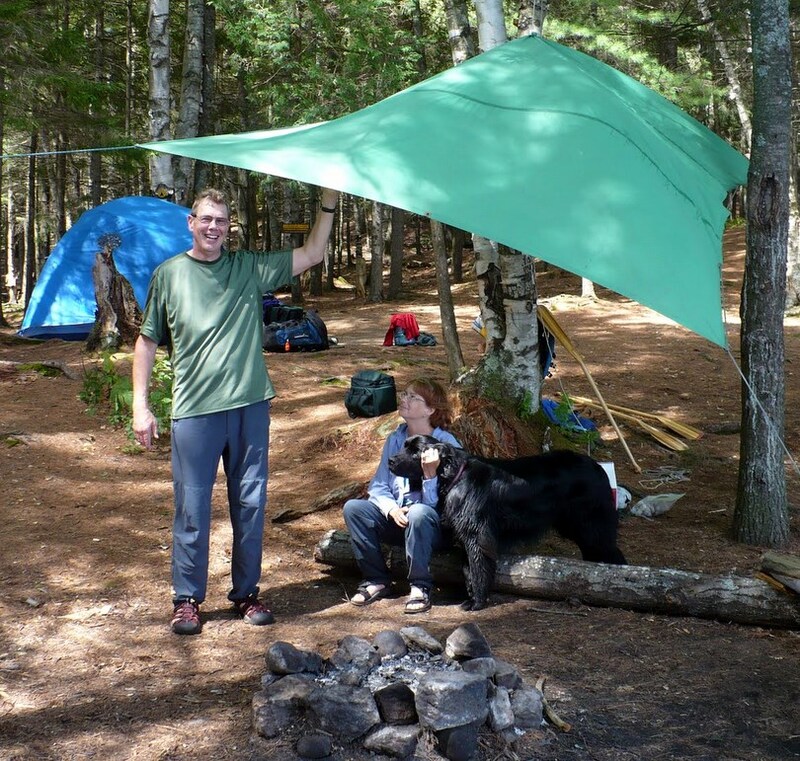 We headed east from our campsite and did the short portage into Slang Pond. 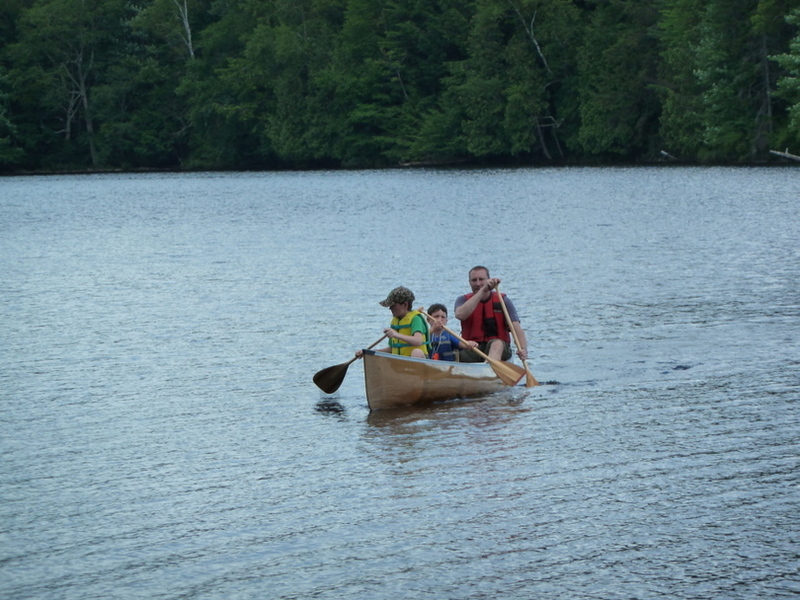 We had to line our canoe into Turtle Pond and carry over the railroad tracks into Hoel Pond. Traveling across Hoel Pond I got a little nervous as Scout shifted around and wouldn’t lay down. From that point on, however, she got comfortable and would sit still or lay in bottom of the canoe. After a short misguided portage out into the golf course we did a course correction and carried into Polliwog Pond. We portaged up and over the esker into Follensby Clear Pond where we took a break for lunch and a quick swim on the 1st island. Leaving the island we paddled south and portaged over the esker into Fish Creek. 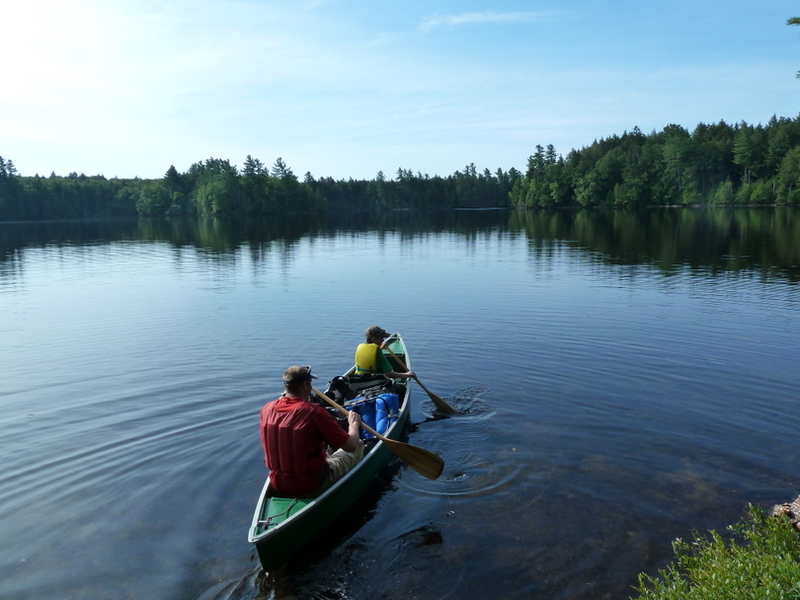 We paddled Fish Creek north westerly passing Little Square Point and went into Floodwood Pond. Fish Creek and Floodwood Pond had a lot of casual boaters and we passed many, many people. In total we probably saw 100 people during our paddle – not exactly a wilderness experience. From Floodwood Pond we portaged back into Long Pond and turned to the west to retrieve additional food and beverages from our cars in the parking lot. 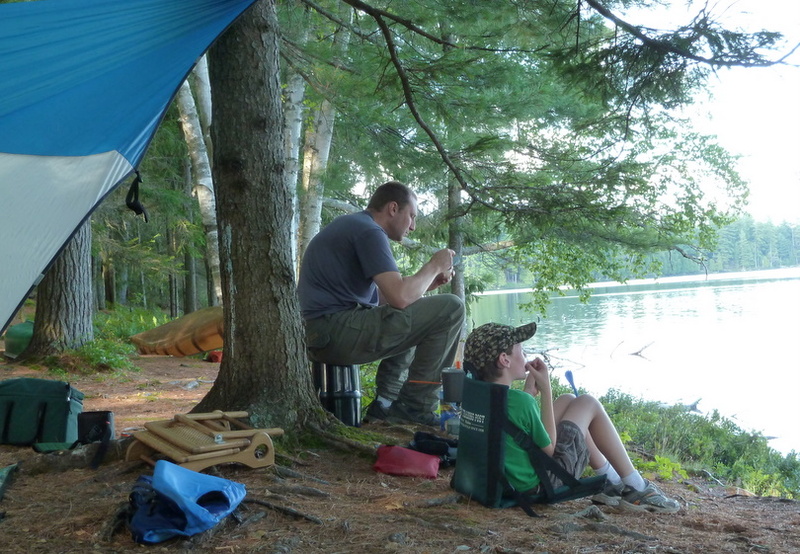 We left our campsite at 9:30am and were back on Long Pond six hours later completing what the guide book touts as a 3 day camping trip involving 10-15 miles. 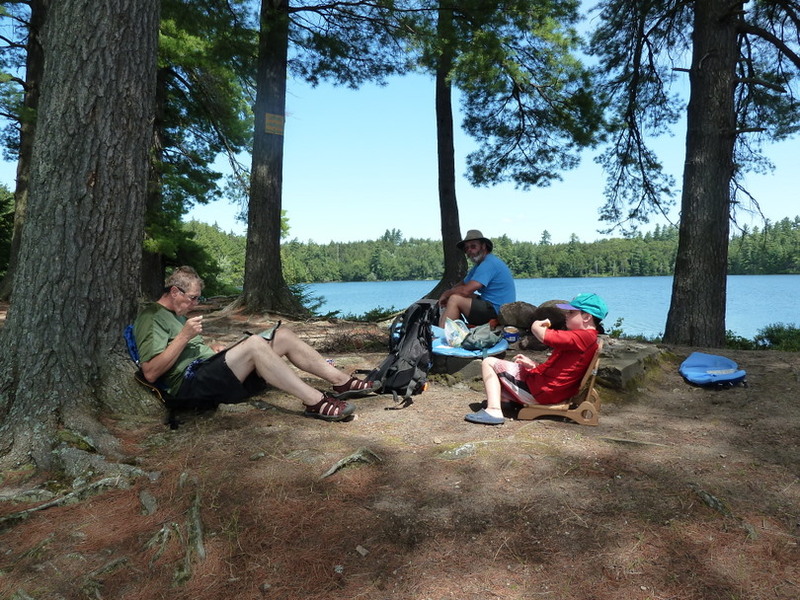 Lunch time on the island in Follensby Clear Pond. Mama and baby loon on Follensby Clear Pond. Upon our return to our campsite we decided to take a quick swim to cool off. Eric wanted to jump out of the canoe so we emptied the boat and I paddled out to let him jump out. We did three trips. 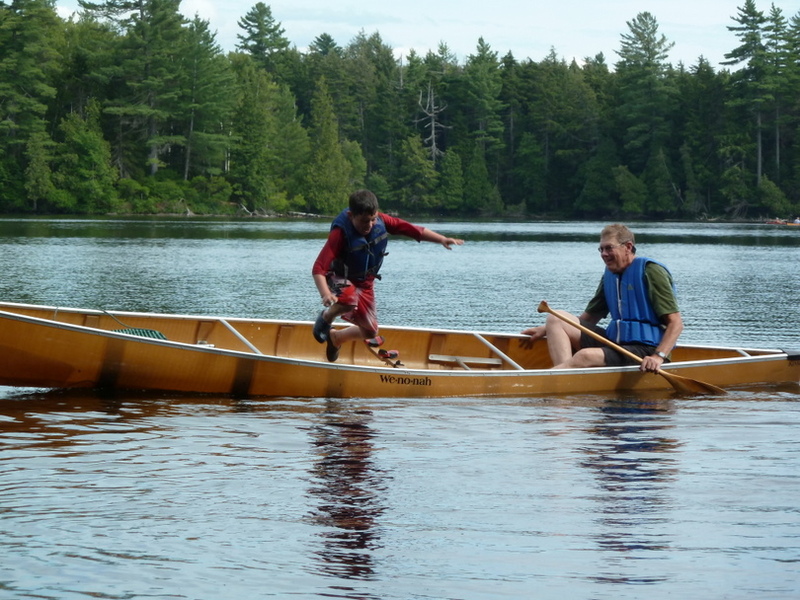 Notice how lax the canoeist is at holding his paddle in the water. On the 3rd jump that lax paddle position caused the following result. Fortunately we all wanted to swim. Friday we packed up and headed out after breakfast. Our timing was good as it started to sprinkle on our way home and Friday afternoon it rained hard.